My PC has been sitting on a custom built stand beside my desk for about 3 years. Every now and then I sit at my desk and notice just how noisy it is. Noisy enough for me to notice it ... even when the forced air heating system is running. That is too noisy. The other day my wife asked me what I wanted for Christmas. I answered, a little off-handedly, that I wanted a quieter PC. I am pretty sure she totally agreed with me ... but then she asked what that would take ... and that got me to thinking ... what would that take? Some googling later, I had found out that I needed quieter fans - the stock versions that came with the Corsair 550D from IBuyPower didn't seem loud but I was pretty sure that I could get quieter ones. The new, quieter fans don't need to fit any sort of color scheme (my case does not have a window and even if it did ... it is between the wall and the side of my desk) ... so Noctua fans seemed like an easy solution. After Christmas, while swapping out the two intake fans for Noctua ones, the temps in my PC went crazy. I had noticed that the idle temp had increased from the 30s to the 40s but hadn't really thought much of it. I think I took out and re-seated my Corsair H60 about 5 times before deciding that the liquid cooler was kaput. I got a replacement from Corsair via warranty but ... sometimes even free isn't good enough. Another chance to look at a quieter solution, not to mention a move away from liquid cooling ... enter the Noctua NH-U12S. I don't overclock or run tons of high heat games ... so this was a very nice solution to me. As I type this, the idle temp is 33. I also picked up a Phanteks 140mm Fan that is running as the sole outflow fan. So ... two new Noctua 120mm intake fans, a new Noctua air cooler and a new 140mm outflow fan ... resulted in a drop in the Dbs ... all the way to 27 ... sometimes 26. Yes ... something starts grinding in my PC ... to the extent that my wife complains about the horrible, deafening noise. Putting the PC in sleep mode (or turning it off) was good enough for the sound to go away. However, that did make it hard to determine what was the issue. I wasn't sure if it was a HDD, a fan failing, or something else. I even had to sit with the 550D open on my desk and wait for the sound to return. After days of the PC humming along very nicely on my desk, I decided to replace the side. No sooner had I put it back on that ... GRIND. Bad. And Good. I found out it was my PSU. The old PSU was a no name Arctic Power Supply with a model number that I couldn't find on the inter-web. I ended up getting a Antec High Current Gamer 620W PSU semi modular. Installing the new PSU had its own challenges ... but now the system is even quieter ... 26 with some 27s. Swapping a PSU is a pain. Any other item with the possible exception of a mobo is easy ... pull the old one out, put the new one in. Swapping a PSU means pulling out all of the cables and re-doing them all. The new PSU is heavier and they've gone crazy with the cables ... you can't easily bend the suckers. I have 3xHDDs in a cage (33mm apart) and they gave me about 100mm of wire that I had to bend. 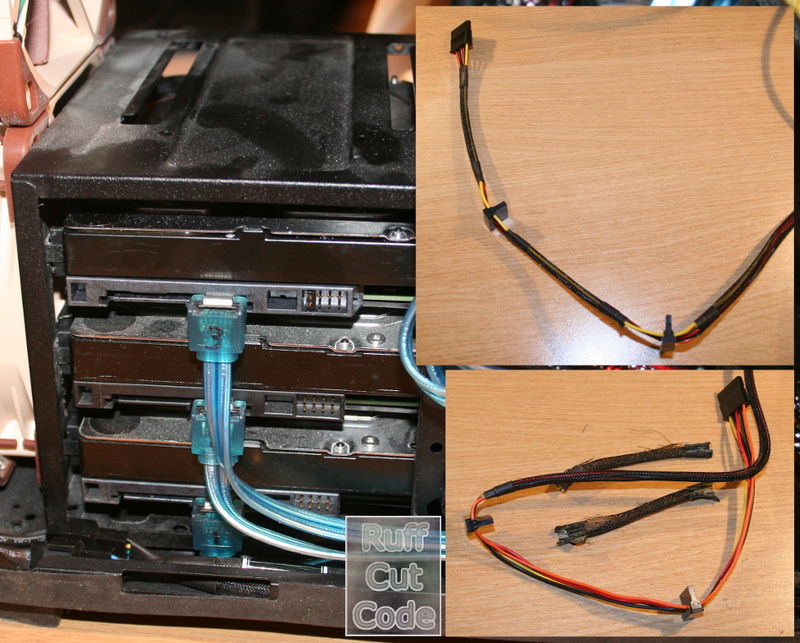 I ended up stripping the sleeving off the sections between the power SATA plugs. I've been looking at making something like the item below ... guess now I have an incentive. Removing the sleeving from the cable so that I could bend it. Gee that looks dusty. I might have to wipe it out ... it gets a regular blow-out. A few before and afters. Before on the left, after on the right.